Ask fellow campers about "Fremont Parks & Recreation - Christensen Field" and nearby attractions. Baseball and soccer fields were close by, so we watched the kids play for entertainment. We camped at Fremont Parks & Recreation - Christensen Field in a Fifth Wheel. We recommend this place if you are visiting Fremont and don't want to deal with the crowds at the state park. Large, level, graveled parking lot with water (2 connections) and electric hookups (50 and 30 amp receptacles). No trees. Dump station is on site. 2 porta-potties in the center of the lot. Great water pressure at our site. Some sites had a picnic table. Large parking lot to the east would be useful for kids to ride their bikes but you won't be able to see them. Huge soccer fields to the west. Horse riding area to the north and baseball playing fields further north. Wide walking path down to the train tracks and along the tracks. No traffic noise from lightly traveled street. There is an airport next door but I never heard one take off or land. We camped at Fremont Parks & Recreation - Christensen Field in a Fifth Wheel. 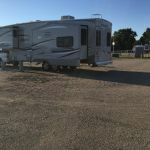 This is a good campground if you just want to park for the night or nights while you are busy elsewhere. It's really just a parking lot that was set up with hookups for campers. The good news is that you get both water and electricity. It's also cheaper than the nearby state park and there is usually a site available. We camped at Fremont Parks & Recreation - Christensen Field in a Fifth Wheel. Gravel lot. Water & electric only, dump station available. Near street, some noise. Clean and lighted, no manager on site. We camped at Fremont Parks & Recreation - Christensen Field in a Fifth Wheel. This is a gravel parking lot with a dump station. Sites are 30 amp water & electric. Self register for parking and/or dumping. Looks like there may be portable toilets, but no restrooms, so mostly self-contained units. Park was clean and good for an overnight with lots of grassy areas around the perimeter. There had been lots of rain but the ground was fairly solid. No frills but a terrific deal. 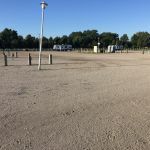 We camped at Fremont Parks & Recreation - Christensen Field in a Motorhome. Are you affiliated with Fremont Parks & Recreation - Christensen Field ?